The latest version 1.2 of the Expanse Reward dDapp introduces new features and fixes most the issues from the beta release. As shown below the overview panel provides a high level market summary of EXR. 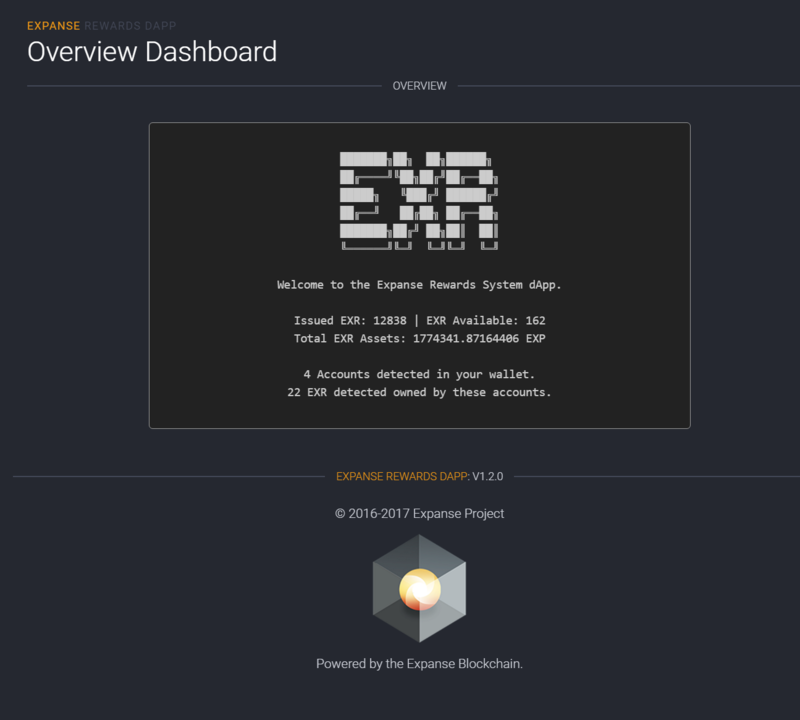 An important measure in the market overview is the Total EXR Asset which shows you the total EXP locked in the reward contract. Another important number are the Rewards Available which shows the number of remaining in the Reward system for users to buy. Before getting into the process of going through the various screens its important to understand the high level flow. It will help you understand the difference between an EXP account, EXR contract and a reward. The first step in using the reward dapp is to launch the app using your explorer on Windows or OSX open the app. To open the app use your favorite utility to unpack the contents to a folder of your choosing. After unzipping the folder will look something like this. The first step in buying bonds is to transfer your desired EXP you wish to lock in bonds to the EBS contract account. 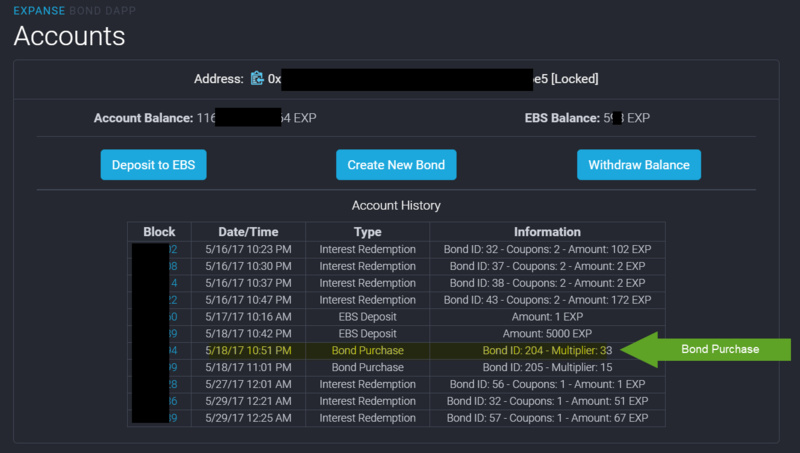 Since bonds are purchased in terms of multipliers and each multiplier costs 100 EXP its best to send EXP in multiples of 100 so you can buy bonds from all your EBS balance. Once the transfer is complete then click the Create Bond button. This will take you to a Panel which will allow you to chose the multiplier. Depending on your EBS balance chose the appropriate multiplier. At the end of the 6 month contract period, you can redeem the principle (initial investment), along with the last coupon payment, and withdraw both back to your EXP account. At this point you can also look at the Account History to review your activity. The highlighted entry in the image below is a bond confirmation entry along with with the block number it was verified on. The next step in the EBS Bond process is to redeem a coupon. You can view available redemptions in the Manage Bonds section. The bonds that have a redemption available will enable a Collect Coupon button right below the bonds. When Collect Coupon is clicked a new pending entry will be created in the Account History grid which will later be confirmed when the activity is recorded on the blockchain. 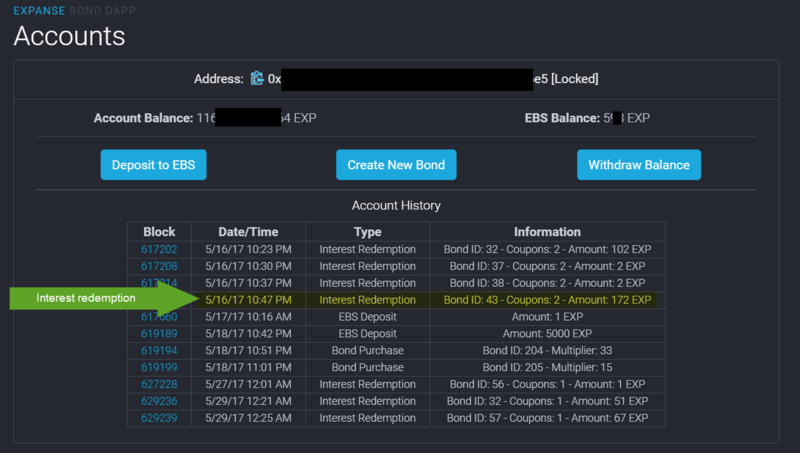 When the redemption is complete it will show up in your EBS balance which can be withdrawn back to the main EXP account. Thats it folks. If you have any questions feel free to join the expanse slack at http://slack.expanse.tech/ and ask away.